There’s a little bit of a vegetable crisis in the UK at the moment. While the weather here has been suspiciously mild, Spain – where something like 80% of Europe’s salad vegetables are grown – and Italy have been experiencing flooding and snow. Hence, the noticeable lacks of things like lettuce, spinach, courgette, aubergine and broccoli. My main question is, who’s eating all that salad at this time of year? It’s cold here, what are they playing at? On the other hand, not being a fan of either aubergine or courgette, the news of a shortage gives me a surge of relief, perhaps I’ll see more ‘vegetarian options’ on the menu that aren’t centred on either vegetable! This winter appears to be one that is determined to make me think more actively about seasonal vegetables and seasonal eating more generally. I suspect there must either have been a bit of a cauliflower shortage earlier this year, either that or there’s been a glut of the stuff the last few winters. Since becoming a vegetarian, I’ve grown used to buying a big cauliflower cheaply to bulk out winter curries and soups. At the start of the season there appeared to be very few of them around and once they did appear they were twice the price they’d been the year before. Handily beetroot was plentiful and reasonably priced so I’ve been continuing my experiments in rehabilitating it into my diet with some enthusiasm. It wasn’t until spinach disappeared from the shelves that I realised quite how dependent I’d become on it as a source iron and general colour in meals. I also hadn’t noticed, quite how often kale could be found on special offer, or just reduced at the end of the day. I still need to pump up my iron levels, so I’ve been experimenting with substituting kale for spinach. Now that I’ve learned the trick to quickly and effectively steam cook my kale it’s proving surprisingly versatile. I’m still a bit dubious about trying it in muffins or on pizza, but so far it’s been delicious in dal and a perfect substitute for broccoli in many a meal. Weirdly, on the broccoli front, while there’s been an utter dearth of those familiar little trees around the place, I’ve been able to pick up packets of broccoli florets (or mixed broccoli and cauliflower florets) in the reduced section on a regular basis. So broccoli and cauliflower cheese has become a regular treat for me (I made it a few weeks back with leftover Xmas cheese, brie makes a really very decadent sauce) and sweet potato and kale bubble and squeak is an unexpected delight. Although the weather definitely started to improve last month, it was still weather that called for some hot and filling bulk-cooking adventures. 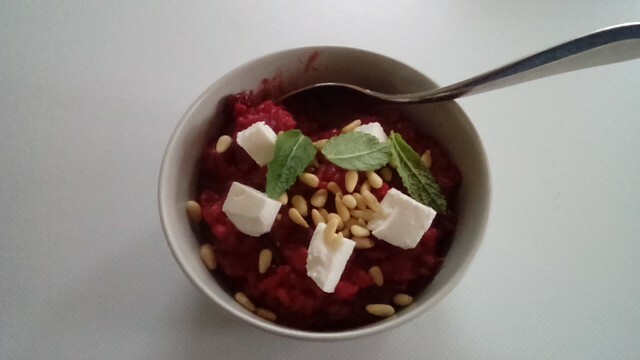 First up we had beetroot risotto with feta cheese and mint. Beetroot is a vegetable that I’m trying to rehabilitate into my diet. It’s a vegetable that I associate with summer salads and quiet resentment. I was the opposite of a fussy eater as a child – I loved food and would happily eat pretty much whatever was put in front of me. Which is not to say that I necessarily liked the food in question, it just had to be really vile – looking at you over-cooked Brussels sprouts) for me to turn my nose up at it. Beetroot was always a bit of a minefield, for a start it’s a bit of a marmite substance in my extended family with opinions divided drastically. And then there’s the vinegar issue, as depending on if its been kept in vinegar or not it tastes completely different. Small un-fussy me would eat a couple of pieces for politeness – often baffled by why it tasted so much better/worse than the previous time I’d had it – and otherwise avoid it. It was always served cold. Once I was old enough to form true opinions on food it was consigned to the scrap heap of ‘food that Wendy will eat but would rather not’ along with cabbage, cauliflower, marmalade and chops. Having successfully re-habilitated cauliflower into my diet over the last couple of years, I felt the need for a new challenge and beetroot seemed a suitable target. (I replaced cabbage with kale in my diet at 9 when my parents started growing their own and now that kale is widely available in the shops, I see no reason to go back.) I did make my own borsht a few years ago and it was…fine. I ate it, but I never bothered to make it again. But digging through my cookbook last month I came across a beetroot risotto recipe that look straightforward and gave it a bash. It came out a truly gorgeous red/pink colour. The recipe suggested using pretty much an entire packet of feta cheese, which seemed to me – having only recently been converted to the joys of feta cheese – to be a little excessive, so I went easy on the feta. But no, it needs the extra feta, which someone how balances the distinctive, slightly cloying beetroot taste. It’s a perfect match of flavours, delicious and filling to eat, really quite pretty to look at. A delightful discovery. My second dish is a little bit of a cheat. As what I ended up making was more inspired by the recipe than actually following the recipe. 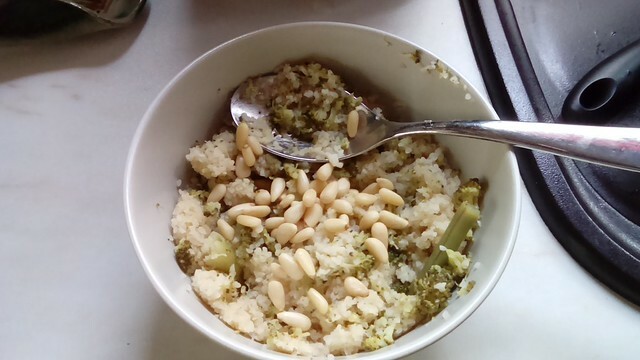 It was supposed to be quinoa, raisins, walnuts and parsley, but I had some bulgur wheat left in the cupboard so I used that instead. The recipe said that you could swap pinenuts in for walnuts and as I had one and not the other in the cupboard I did that. And then my raisins were a bit dried up looking and needed a bit longer soaked in some fruit juice to revive them so I left them out. I definitely didn’t have any parsley but I did have some left-over cooked broccoli from a pasta dish I’d made earlier in the week so I added that in to bulk it up and add the required green element to the dish. It certainly wasn’t what I intended to make but it was rather tasty. I came across a Billy Connelly quote the other day that seemed particularly apt, “Scotland only has two seasons: June and Winter.” And for a while there it looked like this year June had arrived without bringing Summer with it. (Seriously, it hailed last Friday.) So I’ve been making quite a lot of soup lately. The first lot came about purely because I had some broccoli in the fridge that was looking a bit sad, so went looking for a recipe to use it up and came across a recipe for broccoli and blue cheese soup. There was a place in my hometown when I was a teenager that did an excellent cauliflower and Stilton soup, and given that I prefer broccoli to cauliflower any day of the week it seemed a good idea. So I grabbed some leeks and a pack of baking potatoes (you’re supposed to use large floury potatoes for it but the shops are rather low of potatoes that aren’t tiny at the moment so baking potatoes it was) and had at it. It turned out to be an excellent and very tasty idea and definitely one I’ll be making again and again in the future. The dollop of mascarpone is pure indulgence but does mellow the whole business out nicely. A delicious success. It also came with instructions on making your own garlic bread, so I when I had time I ate tasty home-made garlic bread and when I was short of time I had left over fresh baguette to dunk in it. A win all round. 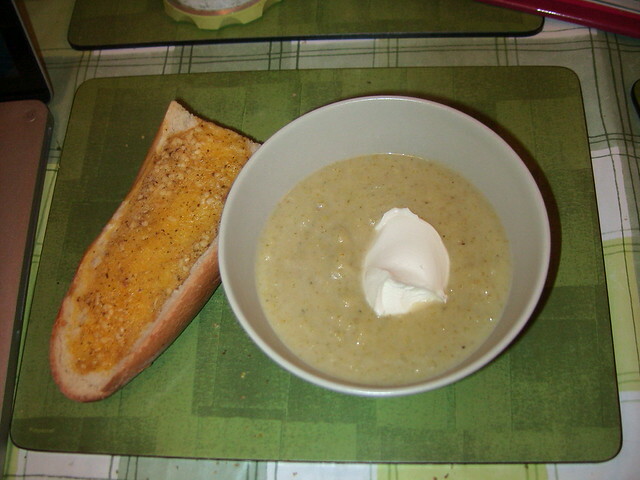 Having bought potatoes and leeks, the nature of these things is that there was plenty of both left over, so I obviously made potato and leek soup. 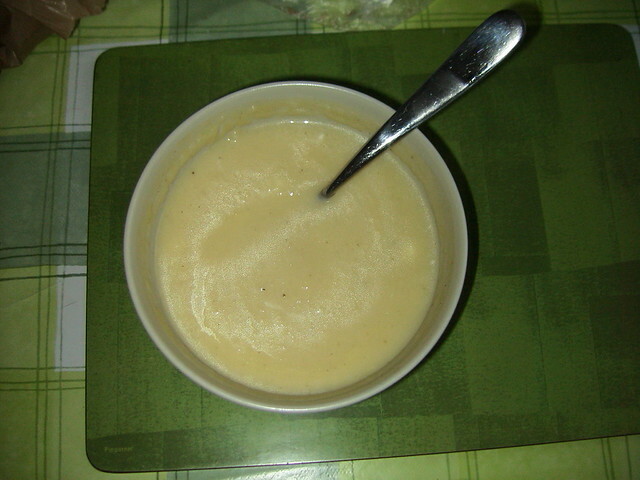 But not ordinary potato and leek soup: potato and leek vichyssoise. Yeah. It’s supposed to be made with chicken stock but have crispy pancetta sprinkled on top as a garnish. As a compromise, as I still have random pork stock cubes in the cupboard, I decided to make it with pork stock instead. This was such rubbish soup, just really bland and bleurgh? I seasoned it to heck and still it was bland weird yellowy soup. So we shall not be making that one again. Rarely does Lorraine let me down, but when she does its pretty spectacular.